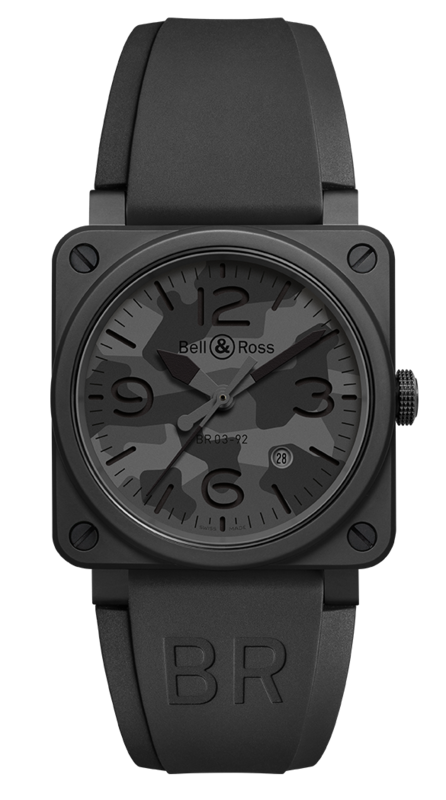 The new BR03-92 Black Camo is the latest addition to the successful series of Bell & Ross camouflage watches. For this model, the brand has developed an original military-type tricolor coating. Its dial is covered with a patchwork of matte greys, its case and strap in matte black. This high-tech timepiece is practically undetectable, especially at night. Its matte-treated colors also avoid the risk of undesirable reflections. This means it can be worn during tailing missions or operations in hostile territory with no risk of detection. Dial: two overlapping inserts. Upper insert with black and grey camouflage pattern, cut away around the numerals and indices, revealing the black Superluminova® that covers the lower insert. Hands covered with black Superluminova®.